Beautiful scenery by the beach and overall great conditions. Really enjoyable course. There is a lot of sand in play, but with big greens and rather wide fairways it is absolutely scoreable. Recommended to everyone. Amazing course with lots of bunkers and waste area. The views are stunning especially holes 5 and 6 along the beachside. It's a cart golf course. Food in the clubhouse is great! 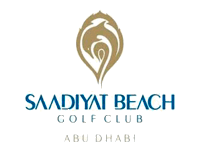 Just 20 minutes from Abu Dhabi airport, this course provides stunning sea views. Saw a couple of dolphins out there. The 11th is the signature hole, featuring Gary Player's hand prints and signature cast in a plaque. Signature Hole ist Nr.6!! Man befindet sich einen Steinwurf vom Strand weg und kann den Badegästen beim Sonnen zuschauen.